My love of cooking goes back a long time. I fondly remember experiments in French Pastry (Paris Brest, cream puffs) as part of my High School French Curriculum with Mrs. Story in 10th Grade at NFA (1970). But it wasn't until after John was born that I really started to hit my stride. The summer of 1983, when we rented a house with Arlene and Larry in Quogue, was a turning point in intensity and complexity of entertaining-- and the key for me, and I suspect many others of my generation, were the books by Lee Bailey. My first one was Country Weekends, and some of the recipes in that volume are classics of my repertoire. No coincidence that the book was published in 1983. The value of those books to me, lay in Bailey's do-it ahead attitude-- he instructed me on the value of advance preparation, simplified serving, building menus with farmer's market-fresh multiple vegetable side-dishes, and, the magic of southern-inflected classics that were festive, easy, familiar-but-exotic, and just delicious. I know that you will love this dish. Everyone who tries it loves it. The two-stage cooking assures that the veal will remain moist, and that you will not be squinting into grill smoke while guest are chatting and sipping. Don't be put off by the long list of ingredients- they are all things you probably already have in the pantry. 1 4-5 lb boned and butterflied shoulder or leg of veal (might be already rolled at the market, if so, just untie it, and remove any "yuckies". Put cleaned and trimmed onion, green pepper, scallions, garlic and parsley in a food processor to chop finely. Heat the oil in a large skillet and add veggies, simmer 5 minutes, and add all the other ingredients except veal and simmer for 20 minutes. Cool. Put the meat in a pyrex or ceramic bowl, and pack the thick marinade all around it. Cover and refrigerate overnight or for 4-5 hours, turning it once or twice. 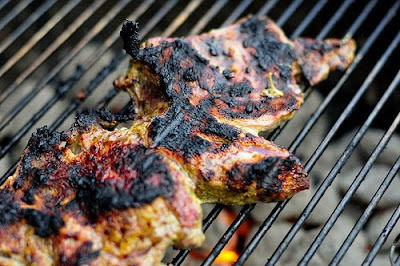 About an hour before you are ready to cook it, take the meat from the fridge to come to room temperature, and start your fire if using charcoal (better). If using gas, heat the grill for 15 minutes. Preheat inside oven to 375. Grill the meat for about 15 minutes per side. Meanwhile, heat the remaining marinade in a saucepan. After the half-hour grilling time, put the meat into a baking pan or a dutch oven. Cover and bake for about an hour. Test for tenderness after an hour, and continue baking another 1/2 hour if it seems tough. When done. remove from the oven, and keep warm and covered until time to serve. It will be fine for at least another 45 minutes. Slice and arrange on platter, spooning some sauce over, and serving the rest on the side. Garnish with fresh mint or parsley leaves or a combination of both. This is wonderful with this side dish, or whatever your CSA or Farm Market has to offer. Rinse and cut new potatoes (multicolor if you like) into halves or quarters depending on size. putting them, as they are cut, into a bowl. Douse lightly with good olive oil, chopped garlic, coarse salt, and fresh pepper to your personal preferences, stir. Cut a length of heavy foil, and place the potatoes in the center, closing the foil tightly around them. Place the packet on the grill and cook for 1/2 an hour or until done. Meanwhile, clean beans, and make another foil packet with them (or steam them, or roast them). These only need about 15 minutes on the grill. When ready, carefully open the packets, and combine them in a serving bowl or platter.